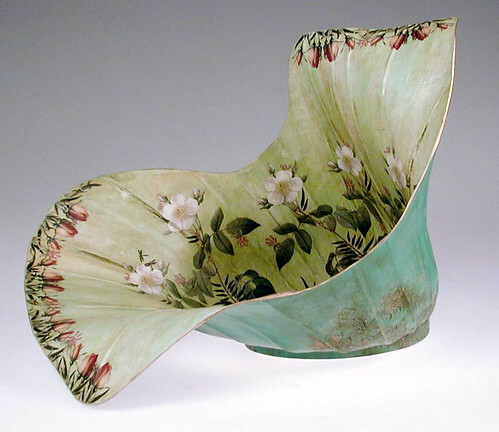 It isn't often that one thinks of paper maché as elegant, but the moment I saw Natalie Wargin's fine decorative pieces, that was the word that sprang to mind. Natalie is a versatile artist who left her small graphic design firm in Chicago where she produced work for big-name clients to move to rural New York. There she creates watercolor illustrations and paper maché art pieces inspired by flora and fauna of the Hudson River Valley. 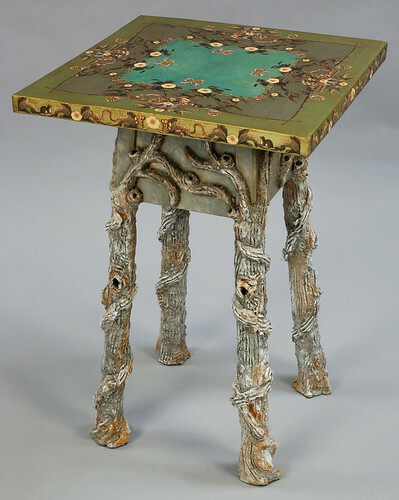 Natalie's objets d'art and tables are a unique combination of paper maché, decoupage, and faux bois. Astonishing but true, the one-of-a-kind pieces are composed of the most ordinary materials... strips of newspaper, phone books, and used cardboard boxes. Natalie told me she isn't sure how she became interested in paper maché, but she enjoys the slow, simple process of layering strips of newspaper dipped in white glue. Experimentation was her main teacher, although she has a number of reference books and looked online for process information when first learning. 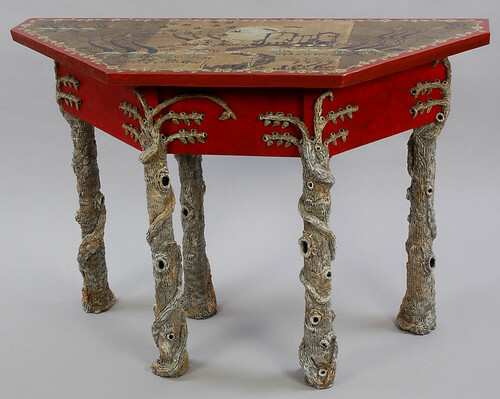 The tables are built from scratch from tri-layered corrugated cardboard which is covered with a few layers of newspaper and white glue, then sanded, painted and decoupaged, and finally varnished. 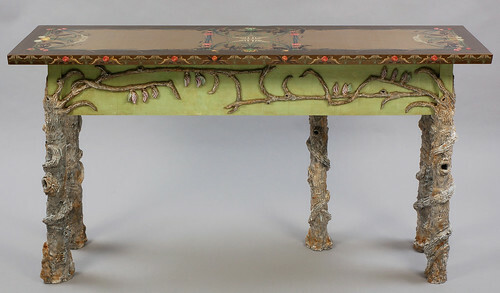 The faux bois legs and details are made by applying paper mâché to wire mesh. Then the faux bois is painted and varnished. The tables are functional. 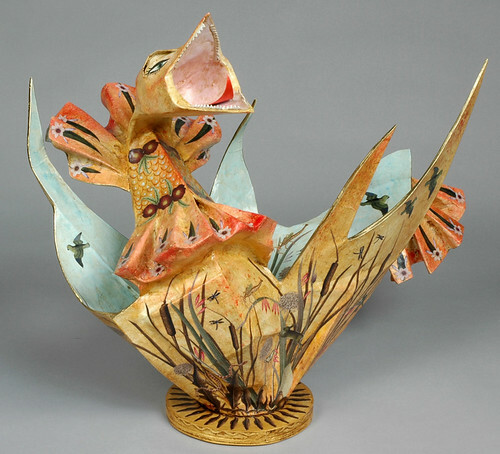 Sculptured containers are made of upcycled cardboard and paper, then painted before she applies original watercolor and gouache paintings. 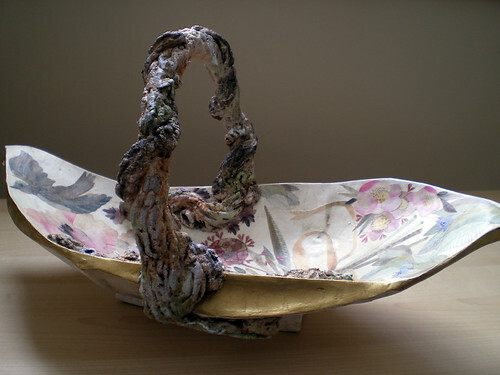 The garden trug below has a faux bois paper clay handle. Each piece is finished with several coats of matte varnish which results in a very sturdy, yet lightweight and water resistant object. To see more of Natalie's work, visit her website and Etsy shop, as well as her beautiful blog. 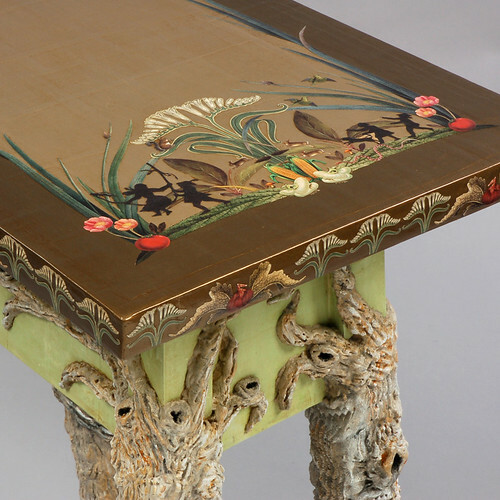 'The tables are functional' says so much about the strength of paper and glue together.Truly Natalie excels in many arts,Awesome post Ann. 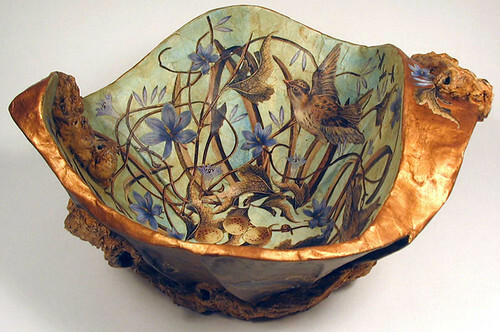 It's hard to believe that these are all handmade papier mache. they are absolutely lovely! Thanks for sharing, Ann. So glad you all enjoyed being introduced to Natalie's work!